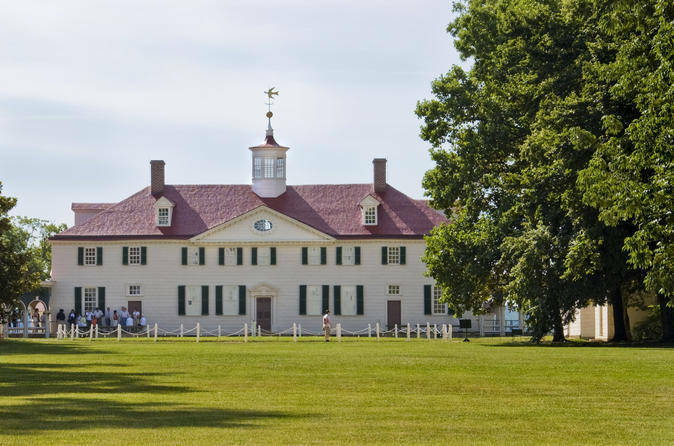 Travel approximately 30 minutes to Mount Vernon, the home and estate of George Washington, one of the founding fathers of the United States and the nation’s first president. On the 500-plus acres of the estate, explore the three-story mansion, extensive gardens and many original sites including a working blacksmith shop and the Pioneer Farm, a demonstration farm with an innovative 16-sided treading barn designed by Washington for threshing grain. The mansion has been restored to how it would have looked when Washington died in 1799. Some of the most notable items in the mansion include the key to the Bastille, presented to Washington by the Marquis de Lafayette, and a swivel chair Washington used during his presidency.Also on the grounds are Washington’s tomb, where George Washington and his family members are buried, a reconstructed slave cabin and a memorial to the slaves who worked at Mount Vernon. Your knowledgeable guide takes you through these sites while sharing the history of George Washington's home on the Potomac River. After seeing the highlights of Mount Vernon and having lunch (own expense) at the historical Inn Restaurant or the food court, your tour continues to Old Town Alexandria. While riding a comfortable bus, see George Washington’s old haunts including Gadsby's Tavern, Ramsay House and Lee-Fendall House. You also will see the town’s major attractions including Old Presbyterian Meeting House, Christ Church, Spite House, Robert E Lee's House and the Torpedo Factory. When your fascinating day exploring Mount Vernon and seeing Old Town Alexandria ends, your guide returns you to the original departure location.